The instrument is shown here without the removable front flap and gives a good idea of the player’s impression of the virginal. The motto inside the lid SCIENTIA NON HABET INIMICVM NISI IGNORANTEM means ‘Knowledge has no enemies except ignorance (or the ignorant)’. The stand under the instrument is a copy based on the stand of the 1650 Couchet muselar virginal in the Vleeshuis Museum in Antwerp. 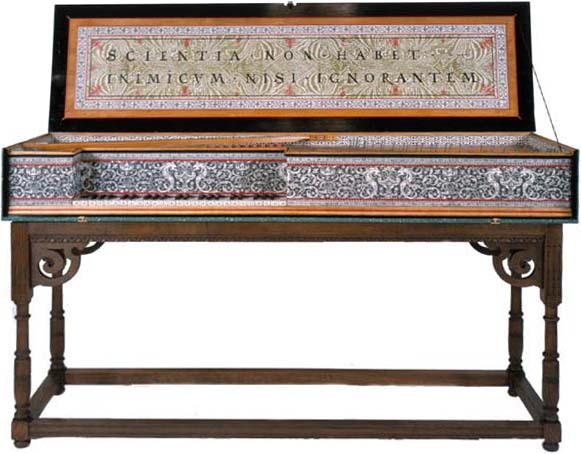 All of the decoration including the preparation of the block-printed papers, the soundboard painting, and the case marbling was carried out by Grant O’Brien.